We've seen a Minimoog-style controller made out of Lego, but how do you like the idea of being able to buy a Lego set that enables you to construct a model of Moog's iconic synth? This dream is not a reality just yet, but a 'Minimoog Synthesizers' set has been listed by a user by the name of grobie87 on the Lego Ideas website, which enables members of the public to propose new sets that could potentially go into production. If the set gathers 10,000 supporters, Lego will review the proposal and decide whether or not to green light it. 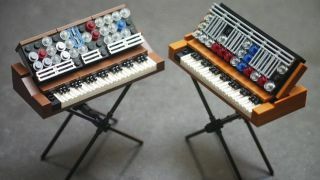 Although the designs aren't exact replicas of the Minimoog, they certainly have the look of the instrument, and their creator says that other synths could also be recreated in brick form. We're certainly impressed; you can show your support by registering on the Lego Ideas website.